Does Your PC heats up too? The problem is the uneven airflow inside the PC case. It’s time you get a good case fan that can maintain airflow and effectively remove the heat from the case. In this article, I have compiled the list of best case fans of 2019. Read the detailed reviews of case fans of all sizes – 80mm, 120mm, 140mm, 200mm and choose what’s best for you. To keep the performance of your gaming rig up to the mark, you must maintain the correct temperature otherwise not only the performance will go down but you may end up with permanently damaged components. And, no gamer would ever want to go through that. Installing efficient case fans in your PC case can solve the problem. Let’s find out the best case fan for your computer. It will keep your system cooler and you can game for longer without worry about the performance or the heat damage. First of all choose size of case fan that you’re looking for. After testing more than 30 PC case fans, I have given my recommendations for each of the following sizes. Click on the image to see the best case fans of corresponding size. Recommended: Having Heating issues with your Gaming PC? Check out the Best Thermal Pastes to reduce temperature by 10°C. Here are the best 120mm case fans that you can buy for your PC in 2019. The best case fan in 120mm category is Thermaltake Riing 12 and even one of the best overall. Why? Because no other fan can be as fast, as quiet, and stylish at the same time. Thermaltake Riing 12 is perfect case fan one can buy. This case fan uses special hydraulic bearings that are lubricated with low friction substance. This results in improved efficiency and lower noise during operation. Also, to reduce the noise further the mounting system uses anti-vibration rubber pads. This case fan has concentrated compression blades (CCB) that ensures high static pressure for demanding conditions. Talking about the design, Thermaltake Riing 12 comes with 4 patented colors – red, green, blue and white. Though Thermaltake Riing 12 is sufficiently silent at almost 25dB-A but more quieter options are available if noise is your priority. The price a bit higher but considering all the features its all worth it. If you have a high end gaming build and all you need is performance, Corsair Air Series AF120 is what you need. Corsair AF120 is completely focused on High Air Flow that allows very efficient large-volume cooling. It requires a 3-pin connector to be connected to the motherboard. The 9 blades fan runs at a high speed of 1650 RPM with help of durable hydraulic bearings. As it is equipped with hydraulic bearings, you can use it at any orientation – horizontal or vertical. On the design aspect, Corsair AF120 comes with a replaceable colored ring. You can choose from White, Blue and Red. There are no LEDs present though. Performance wise Corsair AF120 is very best but it is a bit noisy as compared to others on this list. Also, you have to pay a little extra money for such a performance oriented case fan. 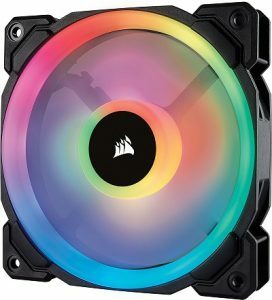 Another good case fan for those who love all the fancy lighting and futuristic look is Corsair LL120 – a true premium quality case fan. 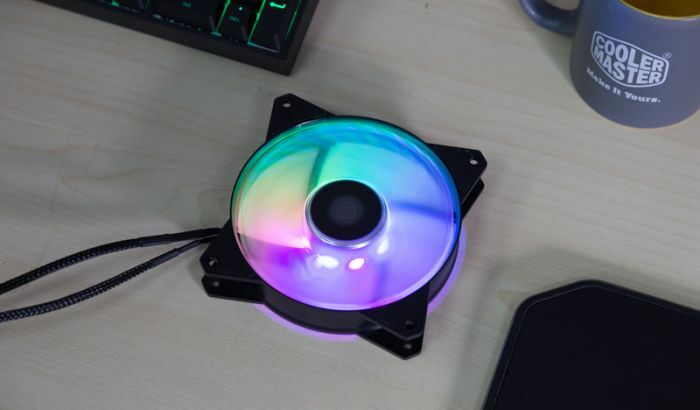 Add this fan to your transparent pc case and see the magic it creates for anyone who sees it. 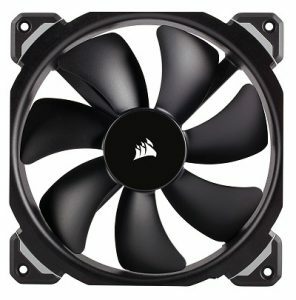 Corsair LL120 is a hydraulic -bearing fan with a perfect balance of speed and noise levels. Also, being a PWM-enabled fan, it allows for dynamic speed control with a minimum of 600 rpm to maximum 1,300 rpm. With that, the air flow and the noise are highly optimized. However, the feature that sets it apart from other case fans in the fully customizable RGB lighting. Though to take the full advantage of the lighting system you have to get a separate controller (around $70). As per the personal experience, Corsair LL120 works amazingly well with liquid cooled gaming rigs but there is no doubt about optimal performance even with basic cooling systems. Let me tell you if you are on budget, this one is not for you but if you don’t mind spending some extra bucks for all the lighting thing, go for it now! Here’s Arctic again and this time in the 120mm case fan category. 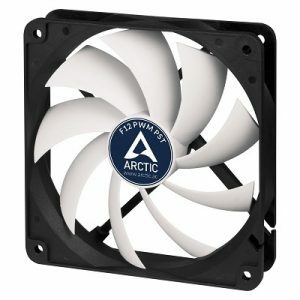 Arctic F12 PWM 120mm case fan just does all the work in cost that anyone can afford. Actually, it is the successor to the Arctic F8 (the 80mm variant on this list). It features the Arctic’s unique fluid dynamic bearing coupled with a 9-blade fan that ensures the temperatures never rise above 38 °C inside your PC case. Also, with PWM feature, this fan keeps the noise level absolutely minimal and only increases the speed if necessary. Just like the Arctic F8, this case fan can also be configured to be used as both air-intake fans as well as air exhaust fan depending upon your requirement. It can be connected to your motherboard with a 4-pin connector. Arctic F12 is recommended for all those gamers who are on budget but cannot compromise on performance. In fact, Arctic F12 is the best budget case fan available in 2018. 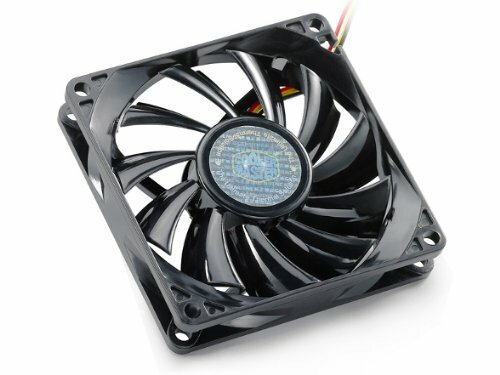 Below are some of the best 140mm case fans you will find in the market. When it comes to larger pc cases, Corsair ML140 case fan can be a great option. It belongs to the popular ML series that uses magnetic levitation technology instead for regular bearing based motors. Because of the innovative technology, the Corsair ML140 case fan ensures that high static pressure is maintained inside the case as well as high airflow for superior performance. The speed control ranges up to 1600 RPM, which makes it easier to balance between low noise operations and peak performance. The all-black look gives this case fan a more professional look rather than a wanna-be approach. Talking about the visual customization, the corner mounts are replaceable with different colors. It also uses anti-vibration rubber dampers that make sure even running at high speeds, there are no unwanted vibrations or noises are produced. No doubt, Corsair ML140 is one of the best case fans according to performance in the 140mm category. The Noctua NF-A14 is pretty much similar to the previously described Noctua NF-A8 except the size. This variant has a size of 140mm that mean it is more efficient air cooling for medium to large PC cases with heavy duty components. It uses the same SSO2 bearing fan that we discussed with Noctua NF-A8. It can run at a maximum speed of 1500 rpm and the speed can be controlled with PWM to make sure it runs with the lowest possible noise and top performance. Noctua has taken care of every minor detail from fan blades to the case. There are special groves on the blades called Flow Acceleration Channels to optimize air flow. By speeding up the airflow at the crucial outer blade regions, the suction side flow separation is reduced and thus leads to better efficiency and lower vortex noise. It also features Integrated Anti-Vibration Pads made from extra-soft silicone. They minimize the transmission of minute vibrations as well as maintain full compatibility with all other mounting systems. The design is minimal with dual tomes of copper and cream but there is not lighting as such. 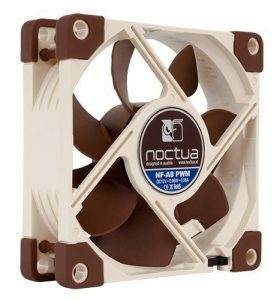 If you are looking for a budget friendly 140mm case fan, then you can go for Noctua NF-A14 FLX case fan. This is probably a new name for most of the gamers out there. But even if NZXT is not very recognised, its NZXT FN V2 140mm case fan speaks for itself. 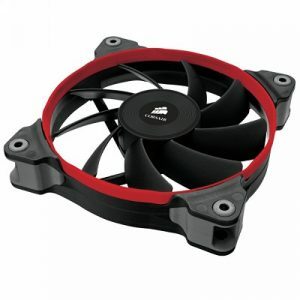 With a classic design, cable sleeves, anti-vibration pads and a lower noise rating as compared to other similar sized fans on this list, it becomes a good case fan. Its fan runs at 1200RPM with Rifle Bearing to offer better acoustics and even better performance. Also, the noise rating of NZXT FN V2 is just 21db-A, lowest among most of the case fans on this list. This exceptionally efficient case fan has a bold black-and-white design which gives premium look even without LED lighting. With all said, this case fan is a superb deal being quiet, efficient, affordable at the same time. 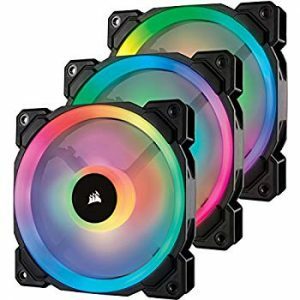 Check out to fthe best 80mm case fans for your PC case available in 2019. Noctua has been in the PC cooling game for a long long time and they what matters is performance. 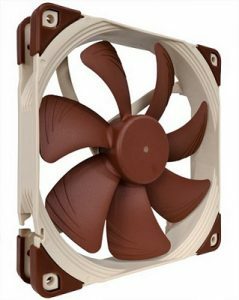 The very first on this list is Noctua NF-A8 Premium 80mm case fan. If you not a fan of LEDs and look forward to some efficient heat removal, this one will do the exact same job. Noctua NF-A8 case fan is built with keeping in mind the regular sized pc cases fitted with some high-performance CPU and graphics cards. Equipped with the signature SS02 bearing, this case fan operates very quietly yet giving a great performance. As far as the air flow and pressure control are meant, Noctua NF-A8 features the custom designed PWM IC that makes it fully automatic while having ultra-low power consumption. Though the aesthetics are not as cool as some other case fans on this list, they aren’t ugly either. It possesses a nice and sleek design with enough cabling space and perfectly placed blades. Talking about the price, it is quite affordable without a doubt and installation is also a breeze. All in all, if you have a regular sized gaming build, Noctua NF-A8 case fan is your thing! Another well-known name when it comes to PC components is CoolerMaster. 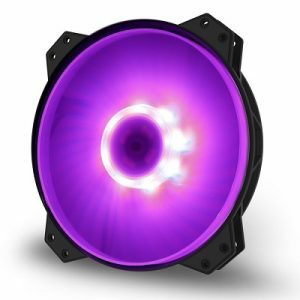 Their most popular case fan is Cooler Master Sleeve Bearing (80mm). With a silent design and good performance, it deserves a place in this list of best case fans. The unique 11-blade design ensures proper cooling for small size PC cases even at lower speeds. High-quality sleeve bearings are used to make it quieter. It produces just 20dB-A noise that is one of the best ratings from all the case fans on this list. This case fan has a 3-pin connector you can plug directly into your motherboard if your motherboard has an available 3 pin connector. Otherwise, you can use an adapter cable to plug into the power supply (4 pins). Though, the design isn’t very fancy neither it has any LEDs, but still as far as the performance is concerned it is at par with the best. 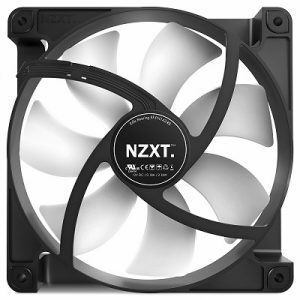 Also, the cost of this case fan is incredibly affordable making it a good choice in 80mm category. 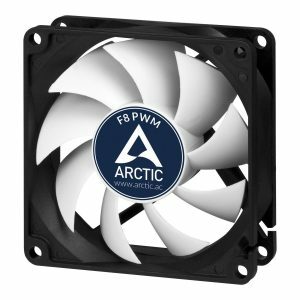 Our third pick in the 80mm category is Arctic F8 PWM case fan. It has got innovative design that allows great ventilation as well as quiet operation. The fan has 9 blades optimized for adequate airflow for smaller PC cases. Arctic F8 also comes with Phase Width Modulation (PWM) feature that allows the motherboard to control the speed of the fan according to the requirement. You can connect Arctic F8 case fan using a standard 4-pin connector. It is equipped with a Fluid Dynamic bearing that ensures a longer service life. Another great feature about this case fan is that you can switch between Push and Pull modes. That means it can be used as both air-intake fan and exhaust fan. At a price less than $10, the Arctic F8 is also quite affordable. But it lacks any fancy LEDs and only efficient for smaller cases. Below are the top 200mm case fans that can serve the purpose for larger gaming builds. In 200mm category, CoolerMaster is again topping the list with CoolerMaster Megaflow 200 case fan. Let me tell you, this one justifies it’s name to the fullest. It is as powerful as it’s name. No matter how large your pc case is, the MegaFlow’s large 200mm sleeve-bearing fan will provide the optimal cooling. The Cooler Master MegaFlow has an air displacement volume of 184 m3/h, which is twice that of 140mm fans. The maximum speed of this case fan is just 700 rpm which makes it very quiet even while operating the top efficiency. It uses a 4-pin connector to be integrated with the motherboard and the speed can also be controlled with phase width modulation. Coming to the aesthetics, the default color is matte black without any LEDs but there are two more variants that feature transparent blades and red/blue LED lighting. 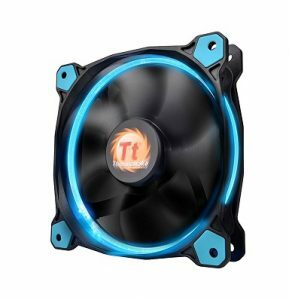 Compared to some other premium 140mm case fans, this 200mm CoolMaster MegaFlow comes at almost half the price. So, it becomes a budget 200mm case fan with amazing performance! You have already seen Thermaltake a couple of times on this list. Here is another high performance case fan from the same – Thermaltake Luna 20. This case fan has a unique 11-blade design which is not so common in the larger case fans. Due to that, Thermaltake LUNA 20 provides an efficient and quiet cooling solution inside the chassis. 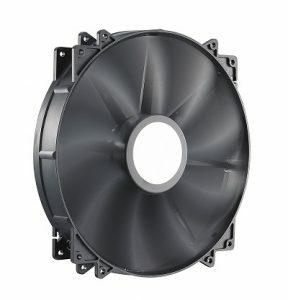 To reduce the noise signature, this case fan has an anti-vibration mounting system that increases stability and reduces noises as well as vibrations. On top of that, it is equipped with sleeve bearings for silent operation. All this collectively ensures ultra-low noise. As far as the design is concerned, it has transparent blades and comes in three different colors – red, white and blue. Thermaltake LUNA 20 also features static LED lighting that adds to the aesthetic value. The last but not the least on our list of best case fans is CoolerMaster MF200R. It is the most premium 200mm case fan with RGB lighting. It has a beautiful hybrid blade design incorporates the jet engine and helicopter blades mechanism. It offers the perfect static air pressure without reducing the airflow. The fan runs at a maximum speed of 800 rpm making it fairly silent. This case fan also has unique Silent Cooling Technology that uses noise reduction techniques along with sound-absorbing rubber pads. This ensures a noise rating of 28dBA which is quite low for a 200mm case fan. To protect CoolerMaster MF-200R from external damage, it is equipped with a Smart Jam Sensor that cuts off the power immediately with the fan gets jammed due to external objects. An exclusive LED lighting system in this case fan acts as the cherry on the top. But again for RGB lighting, you need to have a separate controller. Talking about the price, it has a fair price for all the offered features. Recommended: Want more control over your case fans? Install a good fan controller to tweak around with fan speeds and RPM easily. Check out my list of Best Fan Controllers of 2018. Well, not all PC cases are same. And not all case fans are going to fit in there and give the maximum performance. So, before buying any of the case fans listed in this article, you need to take a closer look at your PC case as well as the connectors on your motherboard where the case fan will be connected. Here are a few important things you need to understand before making the final choice. What’s the Right Case Fan size? To find out the right case fan size, check your PC case manual or go online and find out the case size on the website of your PC manufacturer. In case you are not sure, Just look at your PC case near the heat vents where the case fan fits. Measure the length and you’ll get a rough idea about the size. Generally, most case fans available online come in four sizes – 80mm, 120mm, 140mm and 200mm. And, each of them is used according to your PC build. Learn when to use which case fan. 80mm Case Fan: For small sized PC builds such as HTPCs etc., the 80mm case fans fit better and efficiently cool down mini ITX PC builds. But, being smaller in size, an 80mm case fan cannot deliver the airflow required for medium-sized PC cases. 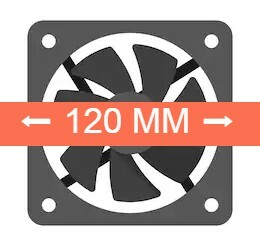 120mm Case Fan: For gaming builds of small to medium size, a case fan of 120mm does the work very fine maintaining the temperatures of the components under control. A 120mm case fan is most commonly used case fan in gaming PCs. Most gamers use two 120mm case fans for adequate air flow. 140mm Case Fan: For building more powerful gaming PCs larger cases are required to house all the components. Such heavy-duty components dissipate more heat than regular and thus a larger 140mm case fan is required for proper cooling. 200mm Case Fan: To be very frank, a 200mm case fan is required only for those gaming beasts that have multi-core CPU, multiple graphics cards and sound cards. Such builds use large sized PC cases for which more powerful air flow is required that smaller case fans cannot deliver. You already know the airflow is important and the speed of the case fan defines how much airflow it will produce. The speed of the fan is measured in revolutions per minute i.e. RPM. Remember, higher the RPM better will be the airflow but high-speed fans will make more noise too. So, it depends on your preferences what you choose. Being a mechanical component, case fans are prone to produce noise. But, the manufacturers are using different technologies to make sure the noise is as low as possible. 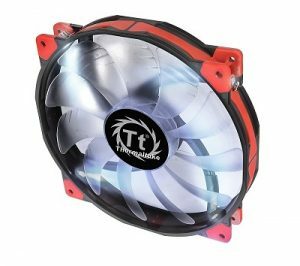 Make sure the case fan you are choosing does not make noise more than 45dB. Bearing Type: Sleeve or Hydraulic? Different case fans are made using different bearings like Sleeve, Ball, Rifle and Hydraulic. Sleeve bearings are most commonly used in mid-range case fans. Ball bearings are faster and quieter than sleeve bearings and can be seen in high-end case fans. Rifle bearing is somewhere in the middle of the previous two in terms of noise and speed. The hydraulic bearing is better than sleeve bearings but not as good as ball bearings. How many Case Fans Do You Need? Depending on the size of your PC case, you can use multiple case fans. Also, to maintain the airflow in the right direction, gamers use two case fans, one for air intake and other for exhaust. So, you must make up your mind on that too. After all the process of research and review, it’s time to give the final verdict about the Best Case Fan available today. Taking into account the perfect airflow, low power consumption, lesser noise generation, good aesthetics and affordable budget, the Thermaltake Riing 12 (120mm) is the overall best case fan of 2018. Also, Noctua NF-A8 is the best 80mm case fan while Corsair ML140 tops in the 140mm category. For 200mm case fan, you must go with CoolerMaster MegaFlow 200. So, What are you waiting for? It’s time to go shopping! 😉 Don’t forget to tell us about your experiences with these case fans while gaming. Also, Share your views about this article in the comments below.